When we consider purchasing a gun we should also consider purchasing a pocket holster. In terms of practicality, there are few things more essential to the bearing of a gun than the manner it is carried. There are many methods and styles of carrying, not to mention differing state laws regarding concealment. How can one navigate the vast array of choices and options? This article outlines the benefits and detriments of one specific firearm carry type, pocket holsters. Sticky Holster LG-6S for Compact Semi-Auto Handguns 3-4"
How Does a Pocket Holster Work? There is not much dignity in the careless and negligent bearing of a firearm naked in your pocket. Even if we put aside the potential damage the weapon might sustain without a protective cover, there is the issue of potential self-harm, and perhaps most vital, the issue of disguise. Many gun carriers desire to conceal their weapon—one practical quality of a pocket holster is its capacity to hide printing, the outline of the gun, as seen from the outside of the pocket. 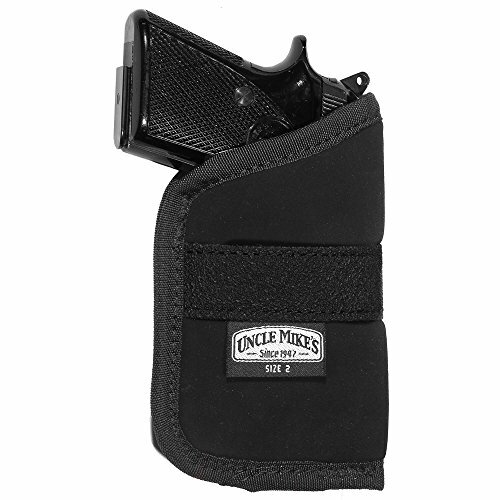 A pocket holster is aptly named due to the fact that it is worn inside a pocket. From there, it can secure the firearm through friction and pressure. These forces are strong enough to stabilize the firearm, yet simultaneously allow the ability for a smooth draw, all the while leaving the holster in the pocket. Pocket holsters are ideal for smaller frame handguns. Larger frame pistols may require a different method of carrying. Sometimes even the most meticulous research misses certain vital elements. When it comes to purchasing the right pocket holder for you and your weapon, there are some practical considerations one should not go without. For instance, it goes without saying it is the responsibility of the gun owner to obey any concealed carry regulations relevant to their home and work locations. It is also good to be mindful of differing state laws when traveling. Another practical consideration is the clothing it will be used with. It doesn’t take a genius to realize deep pockets or cargo pants are more compatible with pocket holsters than tight-fitting women’s jeans. Nevertheless, a pocket holder should function properly regardless of the pocket type. Another important consideration has to do with drawing. 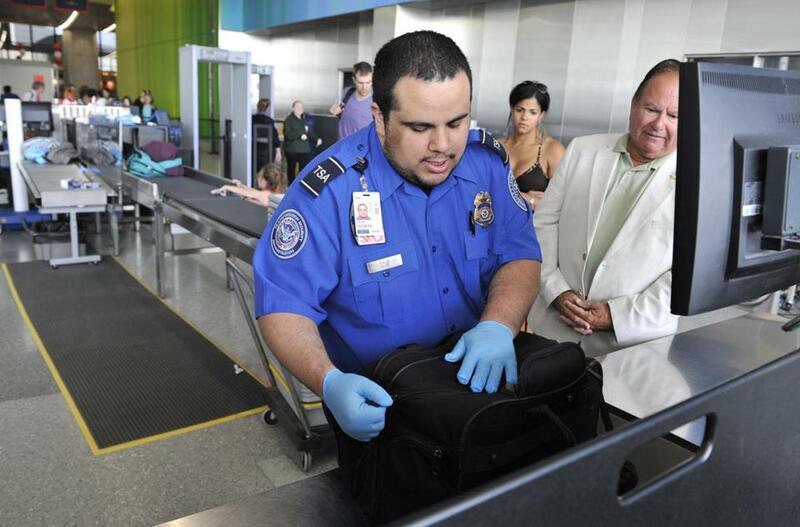 Consider aligning the pocket holder with your dominant hand for preparedness. The consensus of gun enthusiasts is the most attractive and useful quality of wearing a pocket carrier is its casual “ready” access. When choosing to pocket carry, one chooses the element of surprise—pocket carry makes it possible to have a full firing grip without attracting attention. Sticky Holster LG-6S for Compact Handguns 3-4"
Pocket carry is a useful and viable method of bearing arms, so much so, that the market is saturated with fine and numerous options. There are pros and cons to all products. Below you can discover the qualities of the best pocket carry merchandise to suit your gun. The UTG 3.9” ambidextrous pocket holster is one of the best holsters in the market. It can contain a subcompact 9mm, .40 autos, a Ruger LCR, or similar makes. Arguably, it can store other guns of similar sizes. The size of this model is 3.9” x 5.6”. The UTG 3.9” ambidextrous pocket holster is imported. In addition to front and back pocket storage, it offers a side pocket to hold small items such as a certificate, license, cash, or cards. 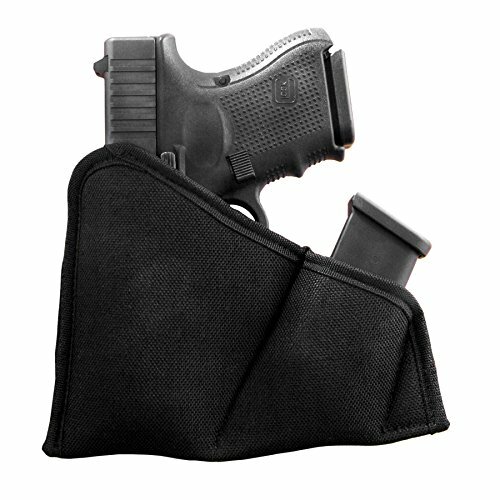 This pocket holster also offers a non-slip band to retain the holster within the wearer’s pocket when the gun is drawn. This holster is regarded as highly functional and marked at an excellent price. It also has accommodations such as the side pocket storage which makes it an attractive and inexpensive carry option. The Sticky Holster LG-6S for compact 3-4” semi-auto handguns is perfect for concealment. 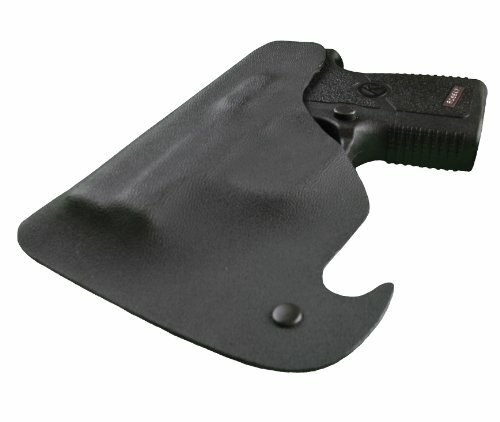 The sticky holster uses friction and compression to stick to the body or waistband, which enables a smooth draw. There are no bulky clips or straps in this model. This ambidextrous pocket holster is closed-end, which means that lint and dust will not compromise your weapon. Likewise, gun oil does not drain onto your body or into your pocket when using this product. It is a U.S. made product backed by a lifetime warranty. This is an affordable and quality item made in the U.S.A. and is backed by a lifetime warranty. Although there is the possibility of the tack wearing and the need for deep pockets, this is an affordable, quality option for your pocket carry needs. 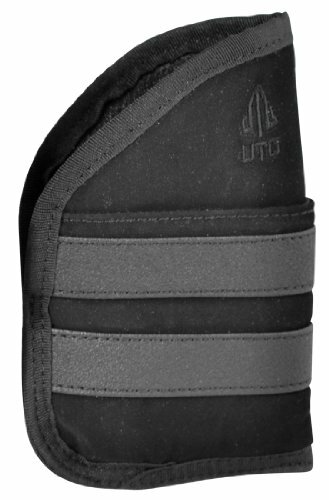 The ComfortTac Ultimate Pocket Holster is lightweight and made of neoprene for comfort. The suede-like coat-cover protects the gun, while the exterior lining ensures the holster retention during a draw. 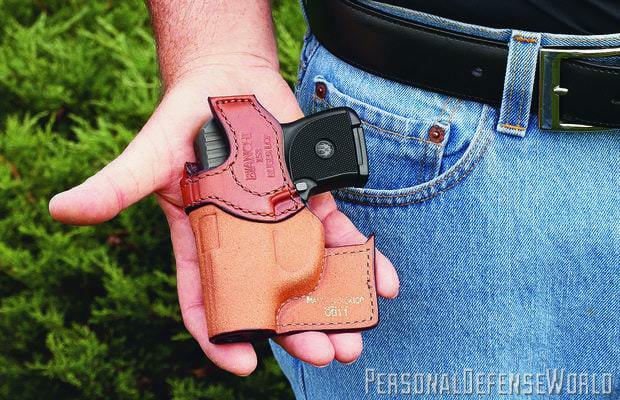 The subcompact holster measures 4” by 3.25”, while the compact holster measures 5.75” by 4”. 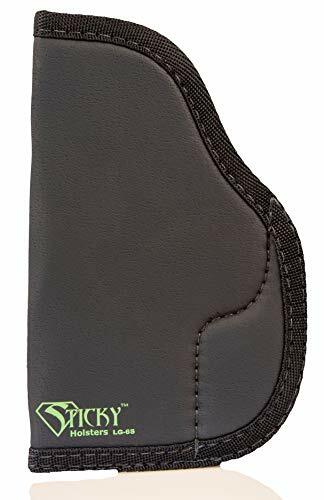 A large variety of guns are compatible with this pocket holster including the Glock 42, 43, Glock 36, 26, 27, 39, 28, and 33, the Smith & Wesson M&P Shield, Ruger LC9s, and many others including Taurus, Kimber, Bersa, Rock Island, Beretta, CZ, Karh, Walther, and more. 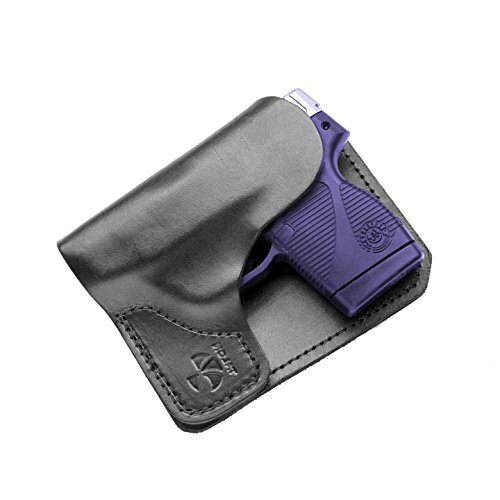 It is an ambidextrous pocket holster with a smooth draw and includes a rubber strap to secure the holster inside the pocket. This pocket holster comes with a “buy and try satisfaction guarantee”, which makes it truly worthwhile to test. This pocket holster provides a specific kind of aesthetic. The Vedder Holsters Pocket Locker is best suited for small framed or ‘pocket pistols’ and is worn in the front pocket. Its most unique attribute is the Kydex material’s capacity to fit the shape of whatever gun model is placed within. During drawing, a hook catches the lower part of the pants, ensuring the firearm is drawn free from the holster. As an added bonus, it is an ambidextrous model. There is also a sweat guard on every holster that covers the pistol and reduces contact with body moisture. This is an innovative product that marks a slight departure from the standard model. It is praised by its users but has not yet reached a wider market. Uncle Mike’s Off-Duty and Concealment Nylon Pocket Holster is known to conceal your weapon with distinction. 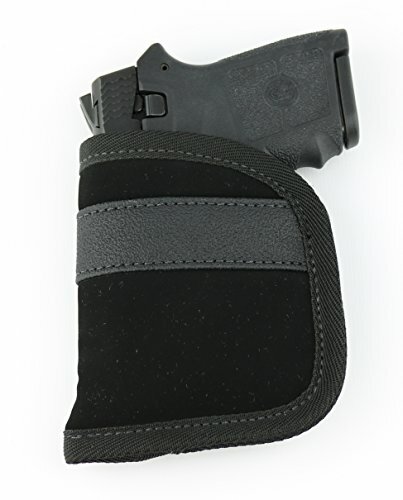 It offers a typical non-slip band to retain the holster in the pocket during drawing. The open-top holster provides grip-up positioning and prevents movement of gun levers, buttons, or catches common to loose pocket carry. The laminate lessens the print and cushions the leg while blocking perspiration. This is an immensely popular product. A vast majority of customers are pleased with the material and quality of this model. There are a few complaints regarding anti-printing capacities, but the lack of a lifetime guarantee stands in the way of a purely affirmative recommendation. The Active Pro Gear Cargo Pocket Holster has a closed muzzle design to keep the gun clean. It is constructed from closed-cell waterproof foam padding which allows for both comfortable bearing and protection from moisture. This pocket holster is lined on either side with Cordura nylon, a material exclusive to Active Pro Gear, which allows for an easy, fast draw. It is made in the U.S.A. and comes in small and medium sizes, suiting a range from the Ruger LCP and LC9 to the Glock 26. It also has room for an extra magazine that supports the holster in a larger pocket. The unique design masks the shape of the weapon, to allow for better concealed carry. Though less popular than other models, the Active Pro Gear Cargo Pocket Holster is made in the U.S.A. and functions as advertised. The cost may outweigh its value but its particular qualities and magazine capacity make it well worth examining. The Talon Concealed Carry Wallet and Cargo Pocket Leather Holster are full concealment holsters with anti-print panels. They are custom molded to fit specific pistol models and are designed and made in the U.S.A. by U.S. law enforcement professionals. This model is known to be one of the best options for school staff or students where concealed carry is legal. Holsters may also fit in the rear pocket. They are made using quality Hermann Oak American Steerhide Leather and are backed by a “No Bull Guarantee”. An immensely popular pocket holster which passes the test of reviews. Aesthetically pleasing, interesting, and made in the U.S.A. Though customers are hesitant to criticize this model, it can be considered bulky. 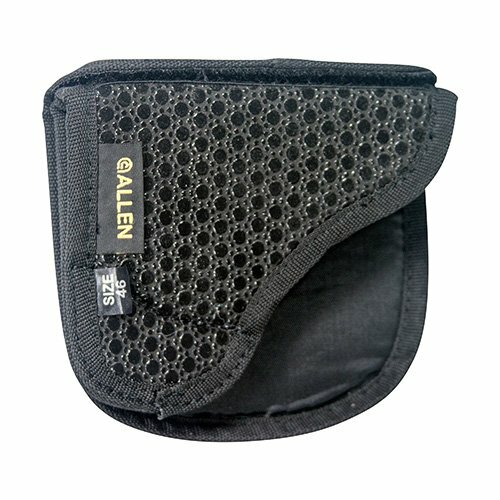 The Allen Baseline Pocket Holster provides a wallet profile. Even during drawing, the holster stays inside the pocket thanks to a tacky fabric. The singular removable padded flap helps to conceal the shape of the gun. Most revolvers with a 2” barrel are suited to this model. This is a product which has not yet taken off and is not made of low-quality fabric. However, it operates as advertised, has a particular aesthetic, and fits a decent range of revolvers. In an ever-expanding marketplace that produces numerous choice products, it can be difficult to find the best deal. When dealing with matters of protection it is more vital than ever to navigate those deals with poise and intelligence. Fortunately, the pocket holsters produced today exceed general standards of quality, while competitors offer more innovative ways of concealing firearms. However, there is a pocket holster specifically made to match each specific weapon, so take the time to research the best fit for your weapon carrying needs.